The Model 335 and 365 Retriggerable One-Shot Timers are functionally interchangeable. 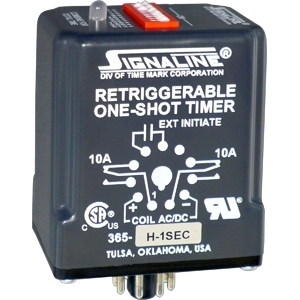 The Model 335 is a DPDT potentiometer (knob-adjust) timer while the Model 365 is a DPDT, high-accuracy digital input timer. Solidstate timing circuits in each model drive an internal electromechanical relay. With power applied to the coil, when the initiate switch (dry contact) is closed, the relay will energize for the time period set by the user. At the end of the preset time period, the relay will de-energize. If the initiate switch opens and then closes multiple times while the relay is energized (i. e. it is retriggered), the relay will then restart the delay time. The relay will remain energized until the retriggering stops and the delay time ends. When power is removed, the relay will de-energize. An SG version of this model is available using silver with gold flash contacts. Models 335 and 365 are UL Recognized and CSA Certified. The Models 338 and 368 Recycle Timers are designed to cycle a load on and off, or to cycle between two loads. The ON and OFF cycles are independently adjustable on each model. The Model 338 is a DPDT potentiometer (knob-adjust). The Model 368 is a DPDT, high-accuracy digital input timer. Solid-state circuits in each model drive an internal electromechanical relay. Each model is functionally interchangeable. They are available in a wide variety of voltage and timing ranges, to cover the majority of application requirements. An SG version of this model is available using silver with gold flash contacts. Models 338 and 368 are UL Recognized and CSA Certified. 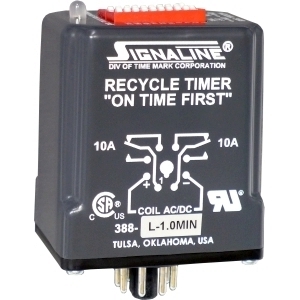 The Models 358 and 388 Recycle Timers (On Time First) are designed to cycle a load on and off, or to cycle between two loads. The ON and OFF cycles are independently adjustable on each model. The Model 358 is a DPDT potentiometer (knob-adjust) timer. The Model 388 is a DPDT, high-accuracy digital input timer. Solidstate circuits in each model drive an internal electromechanical relay. Each model is functionally interchangeable. They are available in a wide variety of voltage and timing ranges, to cover the majority of application requirements. An SG version of this model is available using silver with gold flash contacts. Models 358 and 388 are UL Recognized and CSA Certified.